The blog has kinda been neglected over the past several weeks, but there is a completely valid reason. We are finally putting our house on the market. Our house that is in another state. Our house that we only lived in for two years, but rented out for the past four. So needless to say, it's just a tad stressful when you add another mortgage into your monthly bill situation. Plus, we've had to make sure that it was clean and all that jazz. Stress, I tell you! And unfortunately, I'm the type of girl that runs to food when stress takes over. I wish I was the type that would exercise or obsessively clean, but no, food makes the stress melt away, if only for a moment. So when I thought of something that I 'needed' to eat, donuts instantly came to mind. HOWEVER, for Lent, Mr. Bites & I gave up all fried foods so that meant that my donut craving would have to wait until after Easter. I remembered my lonely little donut pan that I purchased a long time ago. Even though baked donuts aren't really that spectacular, I thought I would give it a shot. 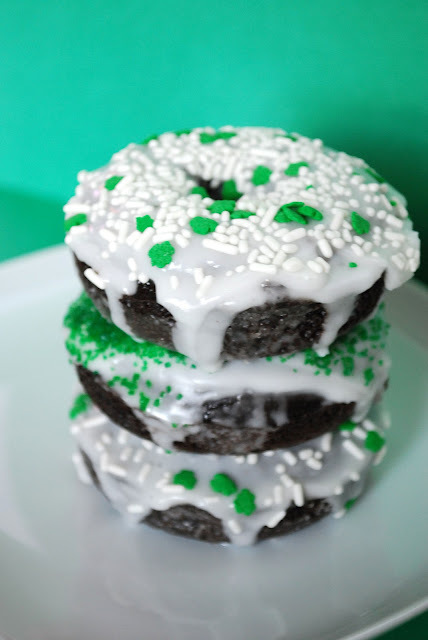 I saw this wonderful recipe for chocolate donuts on Heather Cristo's website. I urge you to check it out. She made these lovely chocolate donuts with a blood orange glaze. Oh. My. Wow. Combine all the dry ingredients in a medium sized mixing bowl. In another mixing bowl, beat together the buttermilk, eggs, and vanilla together and then add them to the dry ingredients. Add the melted butter to the batter and mix until incorporated. Then, pipe or spoon the donut batter into the donut pan. Bake for about 10 minutes. Once donuts are done, turn them out onto a cooling rack and let cool. In a small mixing bowl, stir together the powdered sugar, milk, and almond extract. Take cooled donut and dip just the top of the donut into the glaze. Put on cooling rack to dry. Make sure that your cooling rack has either a sheet pan or waxed paper, something to catch the excess glaze that will drip down the sides of the donut. If you want to decorate with sprinkles and sugars, do so before the glaze is completely dry. I was just wondering about you yesterday Shannon! Glad you're OK, but sorry about the extra added stress. Next time in your in Chatt-Town after Lent you will have to look up Monkey Town Donuts - they are little bites of heaven! Judy Darling Donuts are really good too! Oh yum! I bought a post Valentine's Day clearance heart shaped donut pan, and I can't wait to use it. Chocolate donuts sound like the perfect first use! To quote Nathan: "But the donuts will be heart shaped." Me: "So?!" These are gorgeous! YUM! Good luck with the house stuff. So stressful!